Jack Balkin ist Knight Professor of Constitutional Law and the First Amendment und Direktor des Information Society Project an der Yale Law School. Er ist Begründer des Blogs Balkinization. 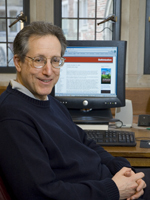 Jack Balkin, professor of constitutional law at Yale University and founder of one of the most widely read blogs on constitutional law in the US, talks about what it means to run a scholarly blog.